To identify products and their source and to differentiate them from others. To communicate information about the product, it’s features, and its location of sale. To induce consumers to try new products and to suggest reuse. To stimulate the distribution of a product. To build value, brand preference, and loyalty. To lower the overall cost of sales. The ad I chose was done by the Leo Burnett Tailor Made Agency for Fiat S.p.A.. The Art Director was Tiago Valadão. 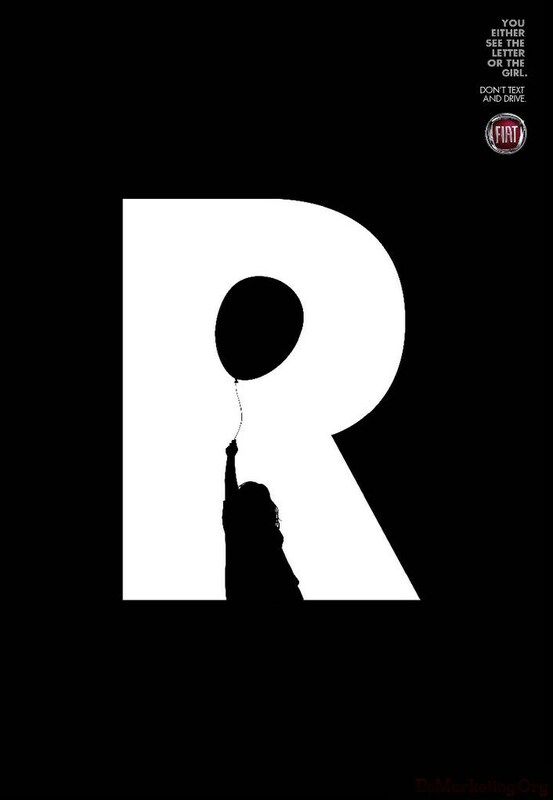 The copy reads: You either see the letter or the girl, don’t text and drive. I feel like this is definitely a drama ad, that identifies the product, and even differentiates it from other car companies because it encourages the view to not text and drive. That is not something I have seen very many car companies do lately. It definitely hits on number three, where it encourages viewers to shop Fiat again, and stimulate the distribution of the product. As well as increasing product use for the same reason: people will see them as a car company that cares. Because of the nature of the ad, where you see one or the other, it is something you can tell your friends about and say, “Hey, have you seen the new Fiat posters?” Which in turn will build brand equity through awareness. The poster also has a certain message that will gain loyalty with its customers. As far as lowering the overall costs, I don’t know about that. Most of the time that is a natural effect of all these things. This was posted under these Blog, Process, Research categories, under these advertising, Commarts, Design, http://www.itcanwait.com/ tags.